£50 DEPOSITS, IT´S ALL GOOD! 1000´s of FREE KIDS PLACES, NO SERIOUSLY! 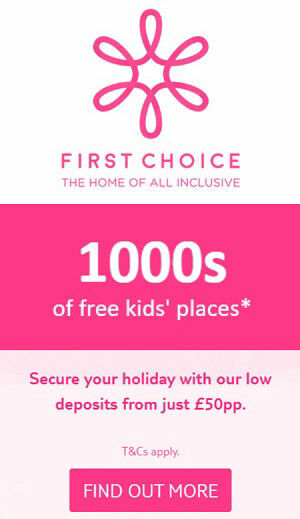 First Choice (part of TUI) are the All Inclusive holiday experts. All of their Costa Blanca holidays to Benidorm include flights, accommodation, transfers, a minimum of three meals a day and local drinks as standard. Upgrades to premium rooms and services are available at selected hotels with even more value for money, including premium branded spirits! As the biggest All Inclusive holiday company in the UK they have got Spain covered for 2019 and 2020 holidays, with a hotel to suit your style and budget and Benidorm has it all by the bucket load. Look out for the 1000´s of kids go free places on Summer 2019 holidays in Spain and across the Mediterranean region, plus a low £50 deposit! 3 star ADULTS ONLY Hotel Riudor (close to all the action). 3 star Flamingo Beach Resort (good value). 4 star RH Hotel Princessa (hugely popular). 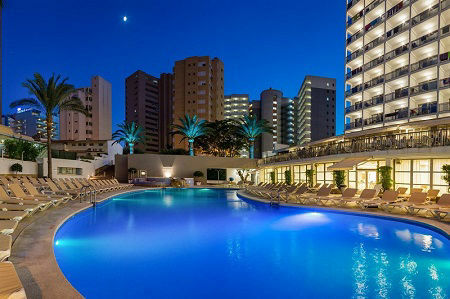 4 star Hotel Sandos Benidorm Suites. 4 star ADULTS ONLY: Sandos Monaco Spa Hotel. 4 star FAMILY: Magic Aqua Rock Gardens. 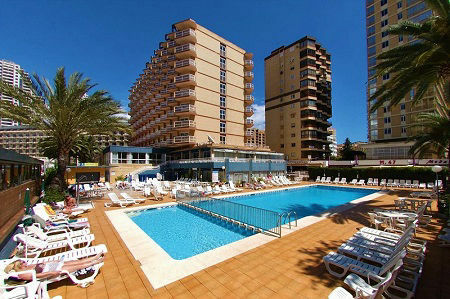 4 star Port Hotel Benidorm (Premier hotel a hop from the beach). 4 star FAMILY: Hotel Magic Natura: Animal, Waterpark & Polynesian Lodge Resort with several pools and big on family fun! Free beach shuttle! 3 star FAMILY: Magic Tropical Splash HUGE lagoon pool (Cala Finestrat). The best sellers from the home of ALL INCLUSIVE holidays in Benidorm! An ideal choice for couples and families. Enjoy two pools (one summer only) with plenty of sun loungers in this smart refurbished hotel. 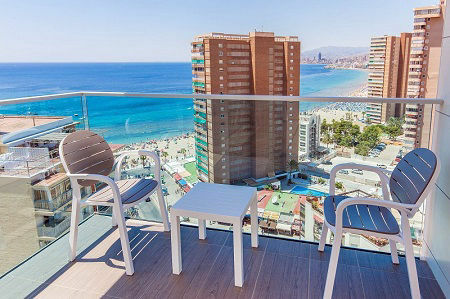 In a quiet central location, the Levante Beach and old town are a 15 minute stroll. NO Stags or Hens. A totally refurbished PREMIER 4 star hotel just a tiny stroll from the Levante beach, nightlife and FUN. A superior choice for couples all year and families in summer. 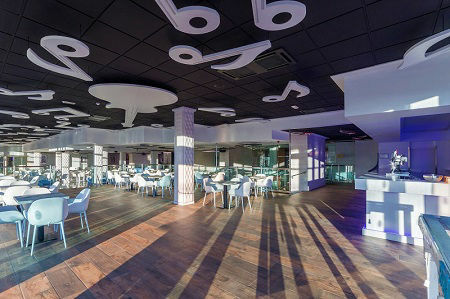 A gorgeously designed hotel for a classic Benidorm ALL INCLUSIVE. Right slap bang in the heart of Benidorm and perfect for a pool and beach getaway! People keep coming back, 100% classic Benidorm holiday with the beating heart of Benidorm right around the corner. Be quick sells-out really fast. Hotel for music fans with regular 70s, 80s and 90s themes plus regular live shows. Enjoy a large pool and choice of bars and colouful guest areas to add to the groovy feel. Beach is just 7 minutes and a short stroll to pubs/show bars. ATOL PROTECED - All FIRST CHOICE (TUI) package holidays are ATOL protected, giving you peace of mind, safe in the knowledge that your money is safe and that you are booking with the largest tour operator in Europe! 17 REGIONAL AIRPORTS - FIRST CHOICE (TUI Airways or selected partner airlines) fly to Alicante from 17 regional airports and in less than three hours too. Fly from: Belfast, Birmingham or Bristol. Cardiff. Doncaster-Shefield. East-Midlands, Edinburgh and Exeter. Gatwick or Glasgow Liverpool and Luton. Manchester. Newcastle or Norwich. Southend and Southampton. DISCOUNT CODES & OFFERS - Super savings with discount codes off selected all-inclusive holidays and hotels. For the latest discount codes and offers see the FIRST CHOICE Benidorm deals page. KIDS GO FREE - 1000´s of free kids holidays at selected hotels and resorts on summer 2019 holidays including Benidorm. You will find top FREE KIDS offers at the 4 star FLAMINGO OASIS, but be quck when they are gone they are gone (terms & conditions apply).